Whether you want to become team lead, an account executive, or a sales manager, you’re going to need the right habits. Below are 28 easily actionable sales tips and techniques to win more replies with your emails, to hold stronger calls, and to become a better you. Save hours per day with simple tools (that plug into your Gmail or Outlook inbox). 1. Give 60 seconds to planning when you get to your desk. What it looks like in sales: Identify when your meetings are throughout the day, and timebox space to call, email, and research around them. Then, hold yourself accountable to those blocks of time and the tasks you want to complete in each. 2. Go ahead, eat that frog. Translation: get the hefty projects done earlier in your day. The prefrontal cortex of our brain is the most active and creative right after sleep. Try channeling that creativity by blocking off an hour to write emails in the morning (see below). 3. Plan your less taxing work for mid-afternoon. A study of 400+ workers showed that 2:55 PM is the least productive time of day at work. As decision fatigue sets in, we become less motivated and active. Set aside this time to log research about your prospects (see below). 4. Clear your desk at the end of the day to start fresh tomorrow. According to researchers at Princeton University Neuroscience Institute, clutter subconsciously distracts you, causes irritation, and negatively affects your ability to process information. 5. Before you go home, set your frogs out for next AM. The CEO of American Express spends his final moments at the office each night by writing down the top three things he wants to accomplish tomorrow. You can do this with handwritten notes, lists on Wunderlist, or by scheduling an email to ping your inbox in the AM (here’s how). 6. Arrive with a list. Take a minute before your meeting to jot down a bulleted list of things you need to bring up, in order of importance (low to high). This sets an agenda and helps you get through the quick items to focus most of your time talking through more important items. 7. Leave with action items. Write down your to-do’s in verb-noun constructs (i.e. “Check with Mark about templates”). If it has a specific deadline, include it. Start using a system like starring the “absolutely must get done by EOD” items so they stick out. For others, set aside time or set an email to yourself to send when you can take it on. 8. Beat your boss to the punch. Try using a Notes app on your laptop to keep track of your to-do’s. Before your next one-on-one, make sure you check off any items you’re the owner of. If you weren’t able to fully complete something, be ready with an update. The worst thing you can do is reach out to someone without taking 30 seconds to personalize your call or email. 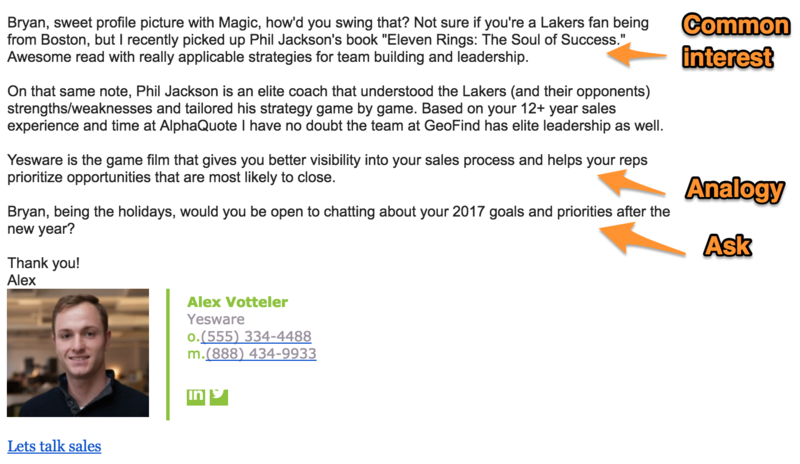 Assuming their time is invaluable enough to intrude with a generic pitch really pisses people off. 9. Check your CRM so you have prior context. To have the most educated conversation, find out if your prospect has engaged with marketing content or your sales team before. 10. Scope their company website. Visit these key pages on their company website: About Us, Careers/Open Positions, Blog. Want more? Here’s a step-by-step post on what to look for (and where) in your research. Get quick insight into their company’s stats, funding, other news, and competitors. 12. Browse their social presence on Twitter and LinkedIn. What are they tweeting about? Browse quickly through their LinkedIn profile for interests, background, and recent activity. 13. Jot down notes about achievements, commonalities, and interests. Take that information and store it for when it comes time to call or email your prospects. Here’s a handy spreadsheet to log your email research. Why it works: Flattery creates a positive impression of the giver— even when the receiver knows there’s an ulterior motive. That, and discovering similarities increase their willingness to buy from you. See email example below for how you can tie in their interests. 14. Choose a proven formula. Knowing what you want out of an email isn’t enough to start writing it. You’re still starting from scratch when you don’t need to. Instead, use an email formula backed by high replies. You save time by knowing exactly what to include and where to put it. Copywriting formulas use psychology to make your email more persuasive. Below is a formula that our SDR team lead, Alex Votteler, uses often. He researches his prospect, finds an interest, and incorporates it into his outreach. Not only is it creative but it gets the pitch across as an analogy. Get 9 more proven email formulas here. 15. Hook them with the perfect subject line. 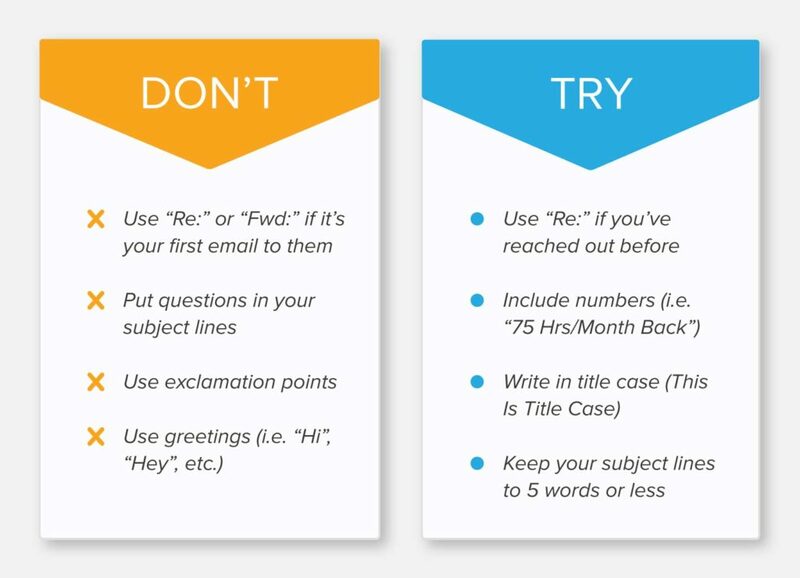 And here are some other tips to try — and mistakes to avoid — when it comes to adding a subject line to your next email. 16. Schedule your email to send at right time. Emailers rejoice: We know that finding the right time to send an email can be a pain point. Especially when you’re in a different time zone than your recipient. That’s why we created an interactive tool that does the work for you: Our Best Time to Send Email Map. 17. A/B test to constantly improve your opens and replies. 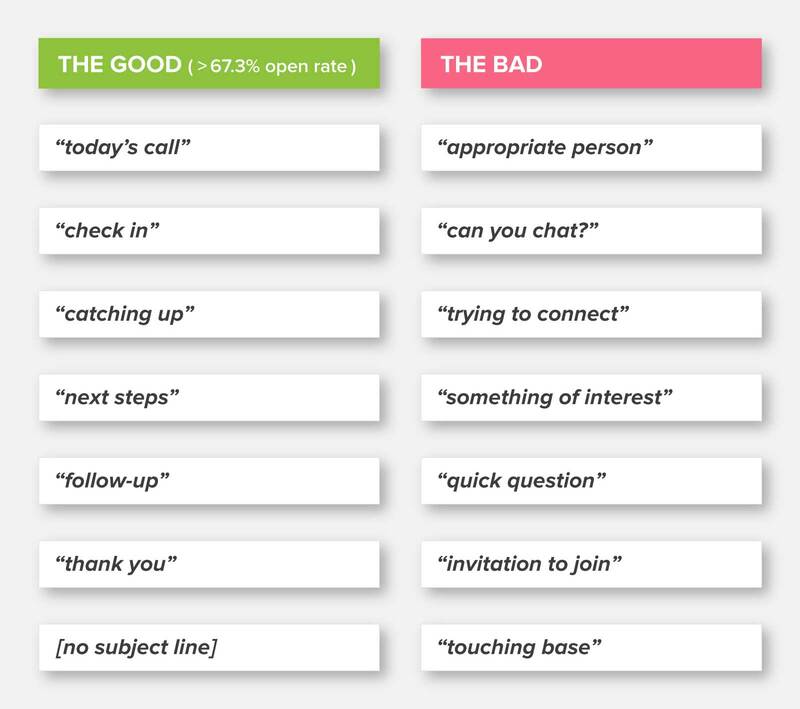 To boost your open and reply rates across the board, play around with your subject lines, email length, customer references, and success metrics. Remember: Just make one tweak at a time to know for sure that your change is responsible for any change in engagement. 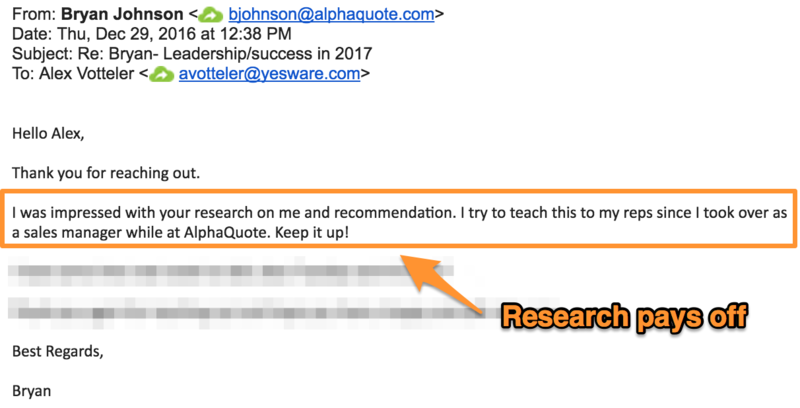 How to A/B test one-off emails: Save different versions of an email as individual templates that live right in your inbox. When you use one, the open and reply stats will sync to that template’s reporting. How to A/B test bulk email sends: Use a tool like Campaigns to split your recipients into two equal batches (up to 200 each). Set up a campaign for one group, then clone that campaign and make your one change before uploading your second group of recipients. Click here to get 18 ideas for your next A/B test. 18. Use automation to press send faster, at scale. You don’t have to type out every email, dial every call, or log every activity on your own. Meet Yesware, the all-in-one inbox plug-in that saves email messaging, sends automated email campaigns, and syncs your inbox to Salesforce. The best part: you don’t need IT to set anything up. It’s a simple, 60-second install that adds all of these features to the inbox you’re already using. Calls can be tough — it’s like trying to swim when you never learned how. Read on for sales tips to have more successful calls, backed by psychology and our sales team. 19. Don’t go in blind. Practice aloud and visualize. When you practice something, actually rewires your brain for better performance. What to do: Our team suggest scheduling “hot seat” meetings with your manager and/or to roleplay a call. Then, set aside a minute or two before your call block to visualize. Studies (and brain scans of ballerinas) show that when you visualize, it activates the cortical regions in your brain and makes you an expert faster. 20. Psyche yourself up with a smile. Smiling during stressful situations lowers your heart rate and reduces that anxious response you feel — even when your smile is forced. 21. Take five deep breaths. When you feel stressed, your body puts itself in flight or fight mode. You can actually counteract this by taking slow, deep breaths that trigger a parasympathetic reaction. 22. Keep your cool for the first 10 seconds. 23. Don’t be scared to lean on (NOT read off of) a call script. New to cold calls? 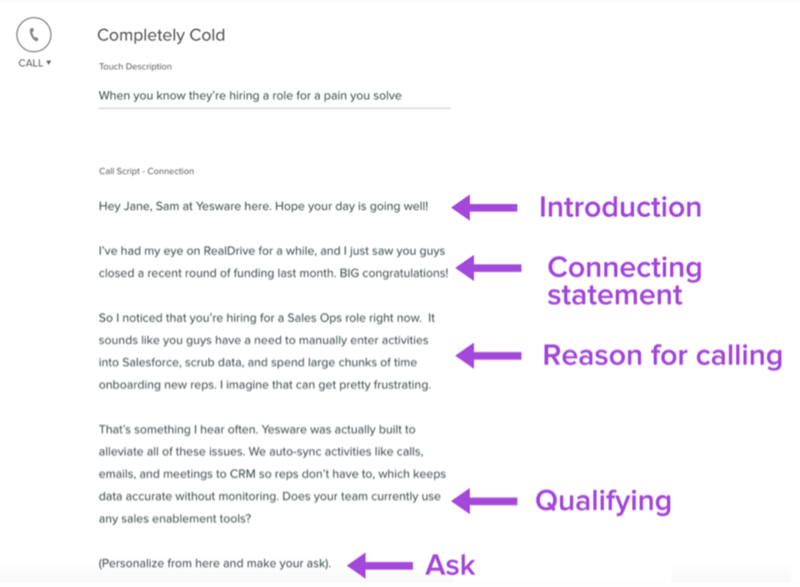 Having a personalized call script on-hand helps you hit your main points. Hint: Yesware’s Touchpoints feature queues up scripts for every prospect you call. 24. Use a bad call to your advantage. Don’t get discouraged by a call that just doesn’t go your way. Instead, take action. “Pull someone you’re close to (who isn’t on a call) into a room and ask them to re-enact the call with you,” says Yesware SDR Sarina Kowaguchi. The best way to improve yourself is to carve out time to take small, achievable steps. 25. Pick a book and start reading it. Research shows that 85% of people who make at least $160,000 per year routinely read books on education, their career, and self-improvement. What to do: Identify your best time to read, and set aside 30 minutes a week to start a book. It might be Sunday night before you start a new work week, during your commute to work, or even during lunch. Go ahead, set a weekly alarm right now for the day and time that you’ve chosen. 26. Subscribe to a sales blog. Rather than going out on your own to find new sales tips and tactics, let them come to you. Want free templates, access to exclusive science-backed strategies, and research? Subscribe to our blog and we’ll deliver it all to your inbox. 27. Listen to one podcast per week. Podcasts help you internalize new information through the theory of passive learning. By having no actual interaction with the information, you’re able to absorb it and learn. As a first step, check out the video podcast, The Exchange, that our CEO Matthew Bellows holds with sales experts. Here’s an episode with him and Andy Paul, Founder of Zero-Time Selling. (Interested in other episodes? Check out our resource page). 28. Write down your personal mission statement. Check out these five examples from famous CEOs. Write yours, keep it at your desk, and schedule an email reminder to revisit in three months. Time management apps = new BFF: Your time is sacred. Use apps to increase your productivity and focus. Don’t try to reinvent the wheel: Steal from our email formulas and techniques that work and make them your own. Dialing with a frown doesn’t cut it: Smiling is scientifically proven to decrease stress and, in turn, help you make better cold calls. Successful people do extra work: Get ahead by reading more books and subscribing to podcasts/blogs.